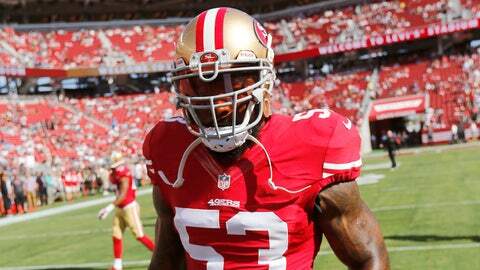 NaVorro Bowman played every snap in Sunday's win over Baltimore. San Francisco 49ers coach Jim Tomsula is formulating a plan to give linebacker NaVorro Bowman an occasional breather during games. That point was driven home after Bowman played all 77 snaps in Sunday's 25-20 victory over the Baltimore Ravens and the 49ers facing a quick turnaround with a home matchup against the Seattle Seahawks on Thursday night. Bowman missed the entire 2014 season after undergoing surgery to repair a torn ACL in his left knee and is still struggling to regain his Pro Bowl form. Tomsula already has opted to have Bowman sit out practice on Wednesday to ease the stress on his knee. Bowman, who tore his ACL and MCL in the NFC Championship Game against the Seahawks in January 2014, will enter Thursday's matchup against Seattle with 59 tackles to rank second in the league. Jim Tomsula said they’re looking at NaVorro Bowman’s rep count, and that’s something they want to get down in the future. He played all 77.